1 Preheat the barbecue or griddle to high. Remove the rind from the watermelon and cut into 8 slices. Drizzle the watermelon on both sides with oil. Cook for 3 minutes on each side until charred. Grill the lime halves for 2 minutes until charred. Remove and arrange on a platter. 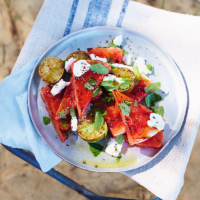 2 Crumble large pieces of goat’s cheese over the watermelon and tear the mint leaves over the top. Drizzle with more olive oil, season, then serve with the lime halves squeezed over the top.